This certainly looks like a thoroughly researched and intriguing book. I see it's for sale on Amazon.com. My only question is should faithful Catholics have any reservations about it's content and conclusions, given the author's Assemblies of God/Baptist/Bible Church Protestant beliefs and education? Does the book contain anything objectionable to Catholics? I've used Keener's commentary on John and it's amazing: a little sparse in and around John 6 with the Eucharist! I wasn't as impressed with Keener's volume on Matthew's Gospel. Perhaps Keener's aim with this monograph is somewhat apologetic in the sense that he does not want to tackle John b/c he knows that such a leap would be too much for some scholars? Keener teachers at Eastern University, right? Looks great! Another perfect opportunity for me to use the 25% off coupon from Barnes and Noble. Thanks for the post. Great analysis of the book. So, would you recommend I pick up his commentaries to read before this book? Is this just more of a synthesis of the commentaries (sans John)? I agree with you wholeheartedly about Keener's treatment of John 6. His 'anti-sacramental' interpretation is, to say the least, far from convincing. Nevertheless, the introduction and exhaustive nature of his research more than makes up for any exegetical weaknesses in the book. For example, although Keener argues for a metaphorical interp. of John 6:53-58, he ignores the fact that in the OT, all of the metaphorical parallels for "eating" someone's flesh and "drinking" someone's blood in the OT refer to persecuting or killing them! For a book with 20,000 ancient parallels, it's strange (to say the least) that he ignores all of these OT parallels, esp. when they are discussed by Raymond Brown at length in support of the traditional Catholic exegesis of John 6). 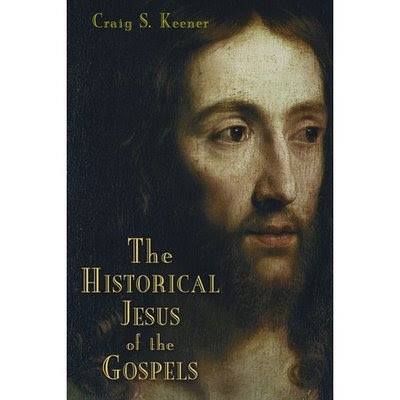 So far, there's nothing in Keener's book that I've read that's contrary to Catholic teaching on faith and morals, although by definition the exclusion of John (as well as certain other elements in the Gospels) will render his portrait incomplete from a Catholic perspective. There are a number of key points I disagree with; for example, Keener accepts the Q hypothesis (which I no longer do), and works with it as a starting point. However, these in no way undermine the overall value of the book; again, his discussion of the genre of the Gospels and historical method is invaluable. As always, the answer is to read an author critically, taking what is good and leaving aside what is erroneous or unhelpful. What you read first depends on your interest. If your interested in Jesus life and aims, read this book first. if you want detailed verse-by-verse commentary to the tune of 800-1000 pages, then go read the commentaries. Though the conclusions are similar, the genres are different; I find historical Jesus books on a whole more interesting to read cover to cover, depending on the task at hand. Thanks for the response, Brant. I will certainly keep all of this in mind when I eventually read this book. I'm especially interested to read it and compare it to certain parts of the Pope's Jesus of Nazareth (Part I and next year's Part II) and Bauckham's book on the Gospels as Eyewitness testimony, as well as other works I've read. Thanks Brant. I'll get the commentaries for general study and reserach, but can't so much see sitting down to read them straight through. Great site. Looking forward to seeing you in Lubbock in February. We haven't met, but you know my Father-in-law, Deacon Waldo Martinez at St. Elizebth's in Lubbock. He turned me on to your site and gifted me the CDs of your presentations on Mary in Lubbock last year. Great stuff! !